Geoloqi, a name you may know because of the mobile app that once provided automatic Foursquare check-ins and geofenced reminders, is today launching its next-generation location platform as an SDK. Although previously available in API format for developers’ use, the new iOS and Android SDK makes it even easier for developers to drop in location services into their apps, whether those are consumer-facing apps, apps for government, carriers, or the enterprise. The company was founded by Amber Case and Aaron Parecki in 2010 and (awesomely) bootstrapped with hackathon winnings until last June when it received $350,000 in angel backing. But even when one of the co-founders is known as a “cyborg anthropologist,” what makes Geoloqi really interesting is the way it handles location services. That is to say, it handles location intelligently. After building a sample app (the consumer-facing Geoloqi), Case says that their phone just started ringing. Enterprise, government and even carriers were interested in the technology and were inquiring about a white label version. Although the company wasn’t ready for customers, they eventually let interested parties start using a beta version of Geoloqi early last year. 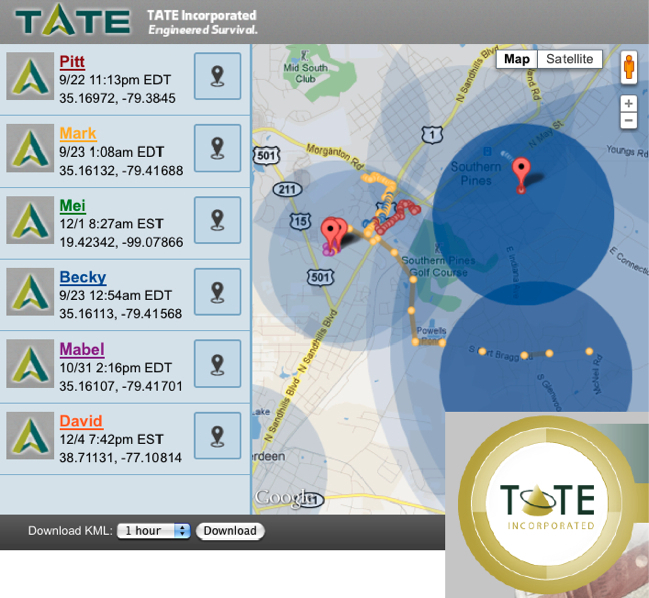 One such customer is TATE, Inc., a company that helps U.S. government personnel overseas, including DoD staff, contractors, and those from other agencies. With Geloqi’s carrier agnostic tech, they’re able to keep their people safe when they’re outside the U.S. using other operator networks. In addition to real-time tracking, Geoloqi’s new SDK also provides access to location-based push messages, geofences, location-based analytics (soon), hosted spatial intelligence, plus support for iOS, Android, Windows and embedded systems. Although the potential for Geloqi’s revenue possibilites lie with its carrier, government and enterprise relationships, such a technology will also help heat up the consumer app space, too, especially when plans start at $19/month (and testing is free). Geoloqi is not alone in hoping to heat up this location services market, however. Other companies, like Urban Airship for example, which acquired SimpleGeo in 2011, will also help bring location-based push messaging to mobile apps. As a potential user of such apps, watching the technology advance is exciting. To date, most of us have been hesitant to use too many GPS-enabled apps, primarily because of the battery drain issues. But if the technology can be pushed forward in a way to reduce the impact on battery life, it could become common for apps to not just remind us and alert us to things, but do so smartly. Imagine coupon and deals apps that could tell you if you’re passing by a place that has a special available, grocery shopping apps that send you your list as you walk in the store, friend-tracking apps whose reminders can be configured by proximity, news apps hyper-targeted to your neighborhood or block, and so on. More details on Geoloqi’s SDK, its pricing and support options are available on the company’s developer site here. Correction: The consumer-facing mobile application no longer does automatic Foursquare check-ins, but the iTunes App Store description claimed it did, up until this article’s posting this morning. The company just sent in an update to Apple which will correct the description in the App Store.